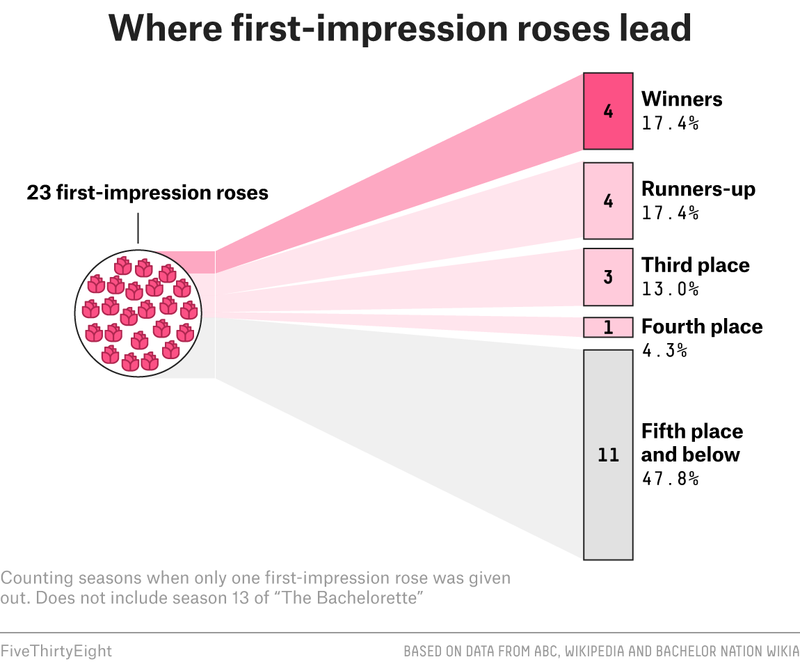 We’re in the home stretch of season 13 of “The Bachelorette,” which means it’s a perfect time to check in on how it’s held up against our rigorous pre-season “Bachelor” and “Bachelorette” analysis. Did Rachel Lindsay — an attorney from Texas who has narrowed the field down to four gentlemen — handle her challenge like previous contestants? 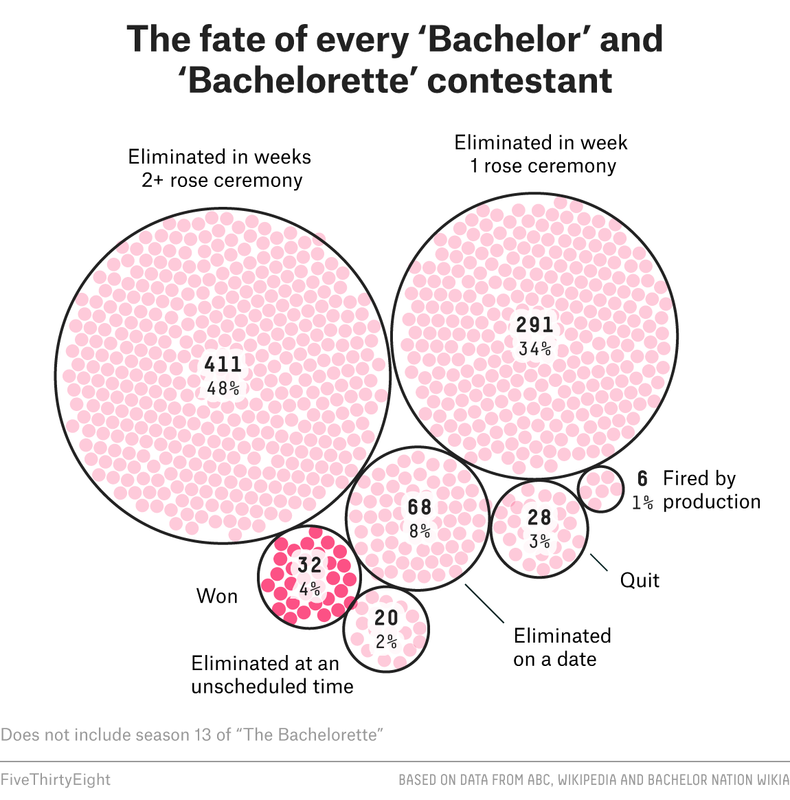 Rachel’s season has seen seven men eliminated on dates, one unscheduled elimination with DeMario (who probably should have broken up with that nice girl before going on television) and 19 rose-ceremony eliminations.1 She seems to favor breaking it off with men on dates more so than her aggregate predecessors. 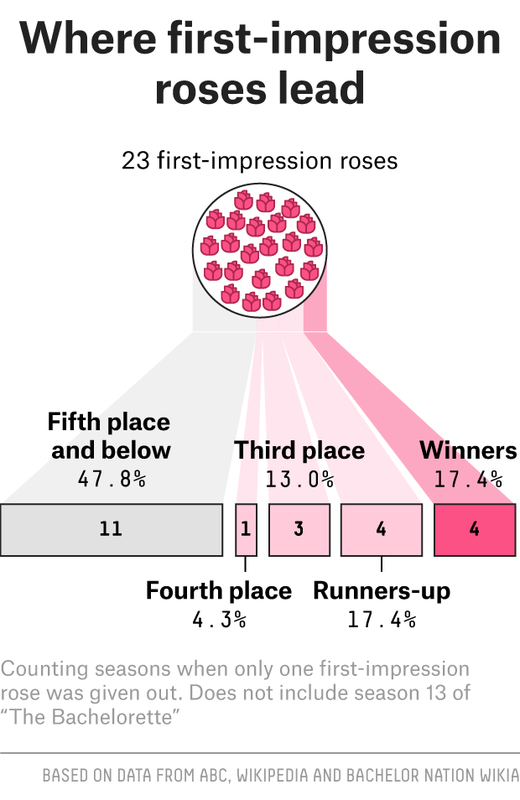 Her season reinforces the historical power of the first-impression rose, the rose given to the contestant who makes the strongest move on day one. The recipient, Bryan, is among the final four going into hometown dates. Love at first sight could be real, folks. So have we learned anything? Well, Peter, Dean and Bryan each had an early one-on-one date with Rachel. Historically, those tend to mean a bit more. More than half of two-on-one date survivors are gone within the next two weeks. Within four weeks of a two-on-one date, 95 percent of participants are eliminated. In the remaining three cases, the contestant won the competition. But most two-on-ones spell doom, swiftly or soon enough. And when Kenny and Lee went head to head, both were bounced swiftly — the serpentine Lee was eliminated on the date proper, and Rachel decided Kenny wasn’t her guy the following week. But that’s all history now: We’re about to go to hometowns! What can we say about what comes next? 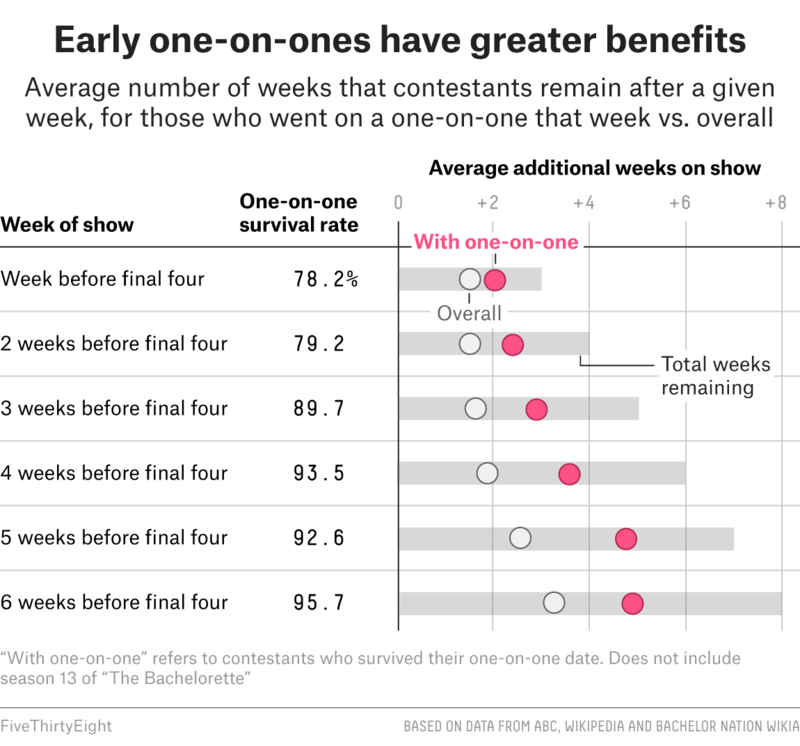 We’ve looked before at how each season has proceeded, considering how much time each contender has had to spend with their Bachelor or Bachelorette by assigning a point value to dates, with a higher value based on how exclusive the dates are. Generally speaking, one-on-one dates are better than small-group dates, which are better than large-group dates, which are better than no dates. 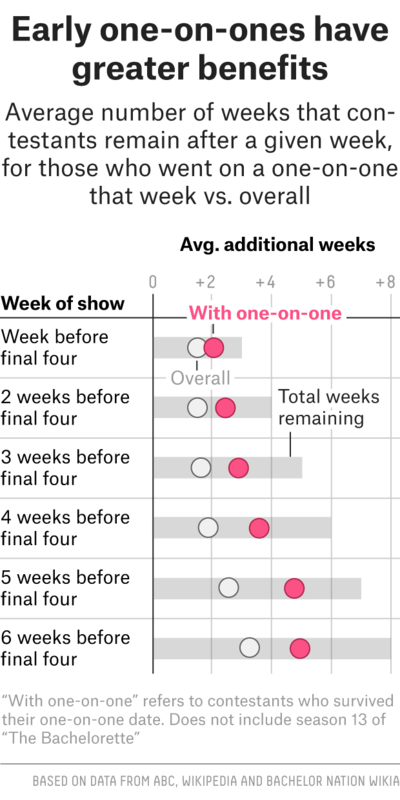 Going into the final four, here’s where all of the men stand, counting a one-on-one as one date, a two-on-one as half a date, a three-on-one as one-third of a date and so on. 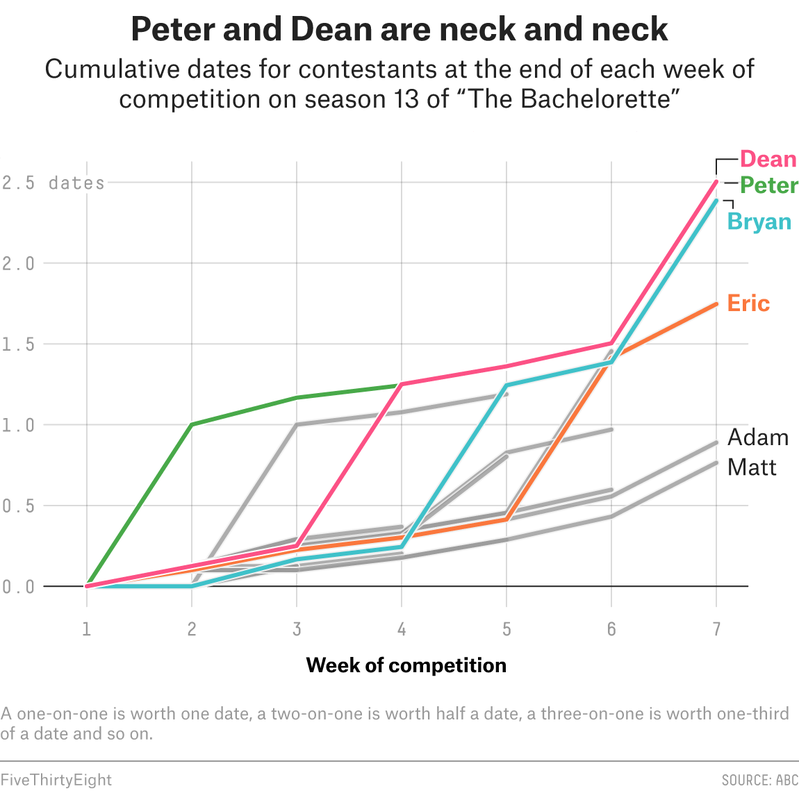 Peter and Dean are neck and neck in terms of time they’ve spent with Rachel, with Bryan coming up just behind. Eric’s late break (getting a one-on-one in week six) was enough to move him forward, though he is far behind the top three. And poor Adam and Matt, who everyone met more or less for the first time as they were getting gently rejected by Rachel last week, never really had a chance. 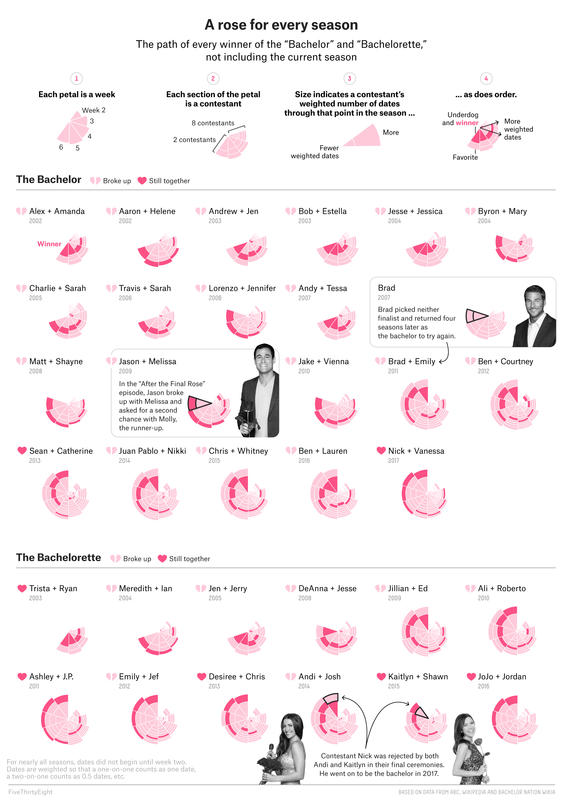 The most shocking thing about the numbers on this chart is the harsh reality that Rachel has been on no more than 2.5 dates with any of the men whose families she’s about to meet. At this point, best-case scenario, she will have gone on a total of 5.5 dates with the man she gets engaged to in the finale. Love! It’s a crazy thing. Kenny, the wrestler whose plot line revolved around conflict with Lee, falls into a gray area. He left in the middle of a group date after deciding he needed to be home with his daughter. Contestants aren’t typically eliminated on group dates, and his departure was technically unscheduled. But this happened on a date, so we classified it as such to maintain consistency.